Background/Info: Leif Bloomquist has already active since the 90s, but I have to admit I wasn’t that at all familiar with this artist and his Schema Factor project. “Plasmavore” was already released a while ago, but this album really deserves some attention. Content: It always is a surprise when you discover a band you’re not that familiar with. The first notes directly reveal the essence of this artist’s work and sound approach. It’s a mix between electronics, industrial and goa. The sequences and space bleeps are definitely into pure good-old goa-trance approach. 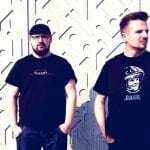 It has been mixed with heavy industrial rhythms and a kind of industrial EBM sound. The tracks remain instrumentals, reinforcing the trance feeling, but sometimes features samplings. + + + : Schema Factor took me by surprise unleashing a modern and elaborated piece of music. The songs have been meticulously accomplished. I like the heavy, stomping kicks, which are joined by space-like psy-trance sequences and sound effects. 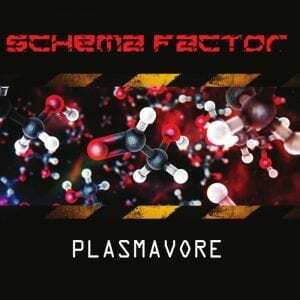 You might call it industrial-rave, but one thing is for sure, Schema Factor going to make you move! I don’t want to compare this band with any other, but I can imagine it’s the kind of work that might appeal to some Implant lovers. – – – : The goa-inspiration might be frightening for electro-industrial purists. Conclusion: “Plasmavore” is the kind of work getting my full support! This is a kind of sonic alien mixing different styles and influences together although the sound remains dark, rough and into ‘rave’! 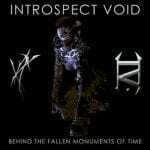 Best songs: “The Universe Between”, “Virtual Tank Gunner”, “High Density Death Wave”, “Plasmavore”, “Anomaly Zero”.